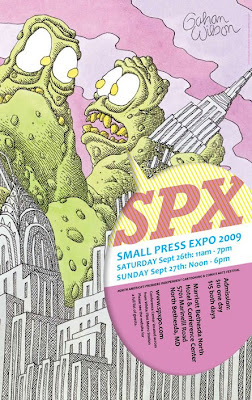 Along with everybody else, I am planning on going to the Small Press Expo 2009. I'll be there Saturday. A murderers’ row of comics critics will address general issues facing comics criticism today and will candidly discuss several new and recent works in a lively, no-holds-barred, roundtable conversation. Rob Clough, Sean T. Collins, Gary Groth, Chris Mautner, Joe McCulloch, Tucker Stone and Douglas Wolk will share their acute critical insights with moderator Bill Kartalopoulos. I saw the critics' panel last year and enjoyed it. Here's my only suggestion to improve the panel: Model it after Tucker Stone's fantastic "Speed Round" reviews (see 6:39 minute mark) so that each critic is given a minute to review as many small press comic books as possible, with each comic being thrown at them by moderator Kartalopoulos. Would Jog blow our minds, but only get through one book because he wants to talk about the history behind it? Could Rob Clough catch all those teeny tiny mini-comics that he likes to review? Would non-blogger Gary Groth participate? Come on, you know you want to see this! RELATED: Here are my posts about SPX 2008 and MoCCA 2009. The Best Comics of the Decade? We're closing in on the final months of the Zeroes, and I thought it might be neat to construct a list of the best comics of 2000-2009. So I made two lists: a big one with lots of titles on it, and a smaller one that might be a top ten of the decade. I should say that I haven't read many of these comics; for both lists I'm going by what I think are considered by critics and fans to be the best comics. There are 70 titles on this list. 8 titles are manga. Only 1 webcomic. This is a working list, which means that I'm going to continue to add and remove books over the next couple of months. I was trying to be inclusive in this first go-round to encourage discussion. I'm also certain that there are some comics that I've forgotten about and belong on the list. Feel free to write a comment with your suggestions for comics to add and remove. Also, are there any books that are coming out over the remainder of the year that have a shot at the list? I'd say Robert Crumb's Book of Genesis looks like a sure thing. Any others? And now for the second list. Yep - that's only nine. I'd say those nine are the most well-respected and critically-acclaimed comic books of this decade. What other book belongs in the top ten? A Drifting Life? Pluto? Parker: The Hunter? [Edit: Acme Novelty Library probably takes the spot.] Any books that don't belong there? And I'm sure a lot of superhero fans would be up in arms over this list. Any superhero books deserve a spot? All Star Superman? (1) Not trying to be funny, and succeeding at this goal. Think Ed Brubaker's Daredevil. That sucker has no time for funny. (2) Trying to be funny, but failing. The flat "jokes" in certain issues of Amazing Spider-man, for instance, or anything written by Stan Lee. (3) Not trying to be funny, but failing, leading to unintentionally hilarious results. Brad Meltzer's DC Universe: Last Will & Testament, or any of Jeph Loeb's recent oeuvre probably qualifies here. (4) Trying to be funny, and succeeding. It's just tough to pull off humor in comic books. Timing is important for comedy, and timing is a difficult thing to master when the reader is the one controlling how fast he or she reads the book. Plus, many people either just aren't funny or are unable to write funny. 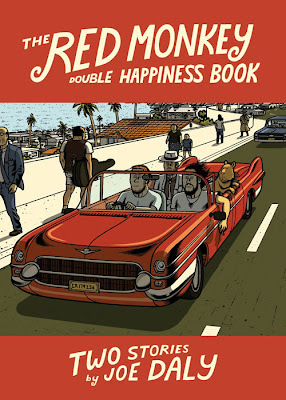 The Red Monkey Double Happiness Book is a category 4. It's a funny comic book, and that should be enough to make you want to check it out. The whole thing has a nice laid-back vibe to it, as Dave and Paul wander into and out of adventures. It's kind of fun to just watch them drive around in Dave's sweet red convertible and look at the scenery. The art has a simple, clean look that retains enough detail to make the setting feel like a real place. And, as I said, it's pretty damn funny. I liked this book and recommend it. DID YOU KNOW? 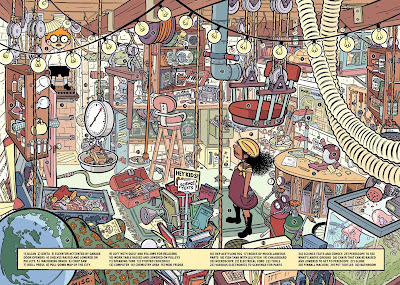 Daly's 2006 comic book collection, Scrublands , was nominated for the 2007 Eisner Award for Best New Graphic Album. READ MORE: Here is a ten-page excerpt. And here's Matt Groening buying the book at the 2009 San Diego Comic-Con. Buy This Comic is an ongoing feature in which I recommend one comic book -- and one book only -- arriving on shelves that Wednesday. Supersmart Julian Calendar thinks moving to a new school will mean he can shed his nerdy image — but then he meets Ben and Greta, two secret scientists like himself. The three form a covert club, complete with a high-tech lair. There, they can work to their hearts content on projects like the Stink-O-Meter, the Kablovsky Copter, and the Nightsneak Goggles. All that tinkering comes in handy when the trio discovers an evil scientist’s dastardly plan to rob a museum. Can three inventors, armed with their wacky creations, hope to defeat this criminal mastermind? 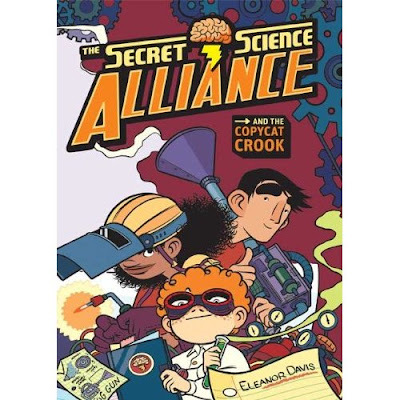 Illustrated in full color throughout, The Secret Science Alliance and the Copycat Crook is a treat for the eyes, with marvelous gadgetry rendered in elaborate detail. And stay on the lookout for more Secret Science Alliance adventures from comic supergenius Eleanor Davis! Davis wrote Stinky, which is one of my favorite children's comic books (my kids like it too). I really like her art, and she definitely seems to have fun packing in little details and messing with the form. Plus, the story sounds great -- who wouldn't want to read about whiz kids inventing nutty things in their high-tech lair? (Anybody remember the 80's movie The Explorers? With a young River Phoenix and Ethan Hawke? This sorta reminds me of that.) Anyway, go check it out -- whether or not you have kids, this looks like a winner.